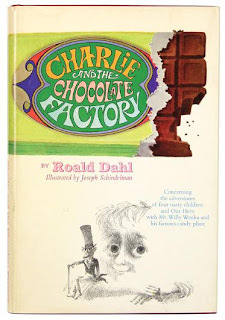 Bookride: Charlie and the Chocolate Factory. Roald Dahl, 1964. Charlie and the Chocolate Factory. Roald Dahl, 1964. Roald Dahl. CHARLIE AND THE CHOCOLATE FACTORY. Knopf, NY 1964. An adventure of one Willy Wonka and 'four nasty children + 'his famous candy plant.' Valuable Dahl book about on a par with his earlier Gremlins. Filmed to some success in 2005 starring book collector Johnny Depp. Also in 1971 with Gene Wilder. Depp's brother Dan used to have a bookshop in Santa Cruz, CAL, the late, lamented Frugal Bookman on Mission. It was the 'frugal' that did for it. A good guy, but not quite in the same league as Johnny when they were handing out the visages. But who is? Oddly the US edition of Charlie precedes the UK by 3 years and has a point on it- you need 6 lines of printing info on the last page, later issues have five. And definitely no ISBN number on the rear panel and with the price $3.95 on the front flap. By such trivia we live and breathe. VALUE? Confusing book-- a very decent one sold in mid 2006 on ebay for $4800. However, one acceptable copy has been on the web at $2700 for so long that the guy is trumpeting it as an investment for when the Jim Carey 2005 movie (sic) comes out. Movies, actually, don't always help and the word investment often says 'Noli Tangere' with a bargepole. A few copies at north of $5000 have been around for a while, it doesnt quite seem to be happening at much more than $5K. Some confusion as to the staining of the top edge, one world renowned dealer calls it puce, another equally stellar dealer calls it chocolate. Can puce fade to chocolate? Or vice versa? A good book inscribed, Dahl signatures are not plentiful - one made nigh on $10K at the Cosmatos sale and later in 2005 another signed made $8k. These prices have flushed out a lot of copies of this once rare book. A book that seems to do best in the white heat of an auction. I bought this copy at a used book store for $3 a few months ago.